Free OST Converter Tool is designed to help those users who want to export OST file to PST in few seconds. With the software users are not liable to fix all the issues of inaccessibility they can also export the OST file into PST file format as well as MSG file format and EML file format. This named application to recover deleted data from OST file help novice users to retrieve their OST database also as it is complying with the simple user interface. User can depend on Exchange OST Converter tool as it will develop with the technicalities which provide the secure process to export the OST files. Users can export emails from OST file without harming the integrity of the data, users can save as it as the data it was before the conversion process. "Unable to expand the folder. The set of folders could not be opened. 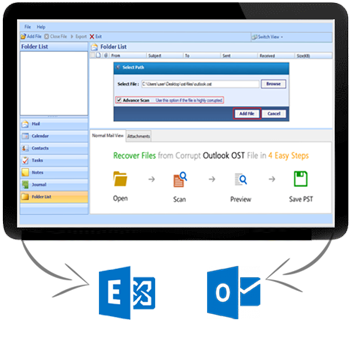 Errors could have been detected in the file Outlook .ost. Quit all mail-enabled applications, and then use the Inbox Repair Tool." Many times users face this error message while accessing the OST file, and because of this error message user can't read the OST emails. But users can remove all the issue of corruption and retrieve the OST emails data with the recommend software swiftly after removing all the error issue. Trial Version: OST Converter Software to recover deleted data from OST file is developed with the trial edition which helps users to check out software working before investing in it. Once user check out the working of the freely OST Converter software they gain the confidence to work with the application licensed version. User can keep an eye on the software working how it recovers email from OST file by running its demo version. The trial version is capable to show the entire recovered items but users are barred to save those recovered items. Purchase Version: The users who want to export OST emails can invest in the licensed version of our application. Application purchase version is designed with the capabilities which help users to repair corrupted OST emails without restricting the users with the number of files. Unlike other application available in the software market; user can get the installation key of the Free OST Converter tool by just spending pocket friendly amount only. Copyright © 2011–2019 www.ostconverter.co.uk | All Rights are Reserved.